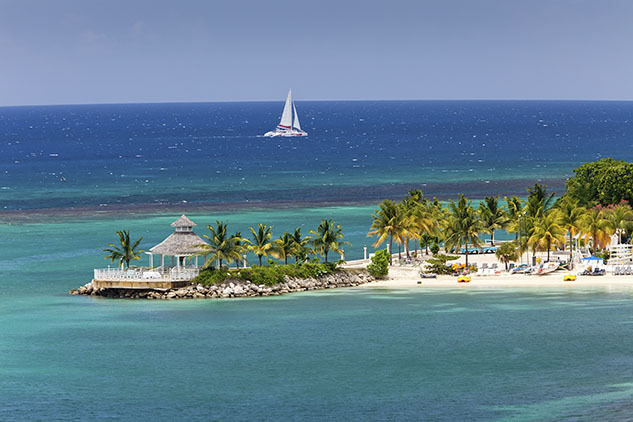 Jamaica is an island nation in the Caribbean, west of Hispaniola and south of Cuba. After Canada and the United States, it is the third most populated English-speaking country in the Americas. It was discovered by Christopher Columbus in 1494, who claimed the island for Spain. It was eventually captured from the Spanish by the British, and remains part of the British Commonwealth today. Under British control, Jamaica became one of the world’s biggest slave-dependent and sugar-exporting nations. 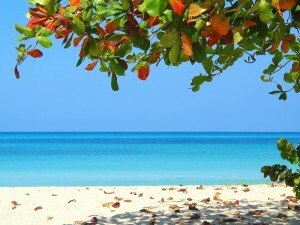 Today, it is a popular tourist destination because of its tropical climate and hot weather. Local taxis are the most popular way to get around Jamaica. Route taxis act as the number one means of transportation for Jamaicans, and act like a bus system would in North America. These taxis are inexpensive but are typically very busy and crowded, and will travel with more people than you think would possibly fit in a car. These taxis are an excellent means of transportation, however, and can be flagged down very easily. Renting a car is fairly easy, as long as you go through an established major car rental company. Be warned, however; driving as a tourist in Jamaica is very difficult. Roads are in poor condition and can be dangerous in bad weather. They are usually very congested. Jamaica does have 250 miles of railroad, but passenger freight service was stopped in 1992. The poor driving conditions, however, have caused the Jamaican government to reconsider using the railroad for commercial purposes. One of the most popular tourist attractions is visiting Nine Mile, the birthplace of Bob Marley, who is now buried there as well. 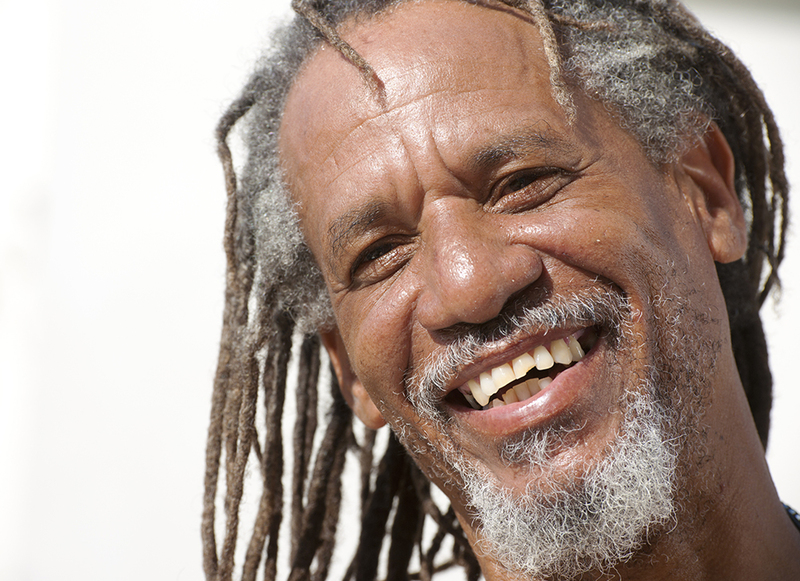 The journey there takes you into the mountains and shows you the heart of Jamaica. 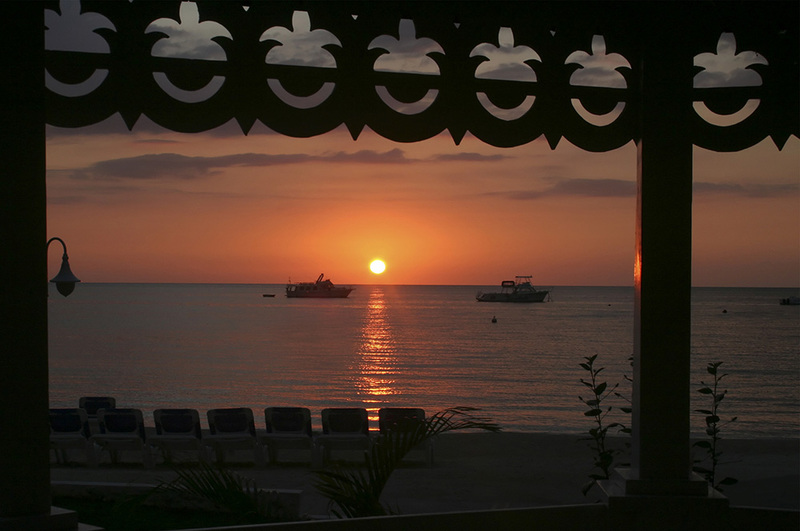 Spending a day at Negril 7 mile beach is a great experience, where you can see a spectacular sunset and watch some breathtaking cliff diving. Some other popular activities include: snorkelling, backpacking, swimming with dolphins, jet skiing, kite surfing, hiking and camping. 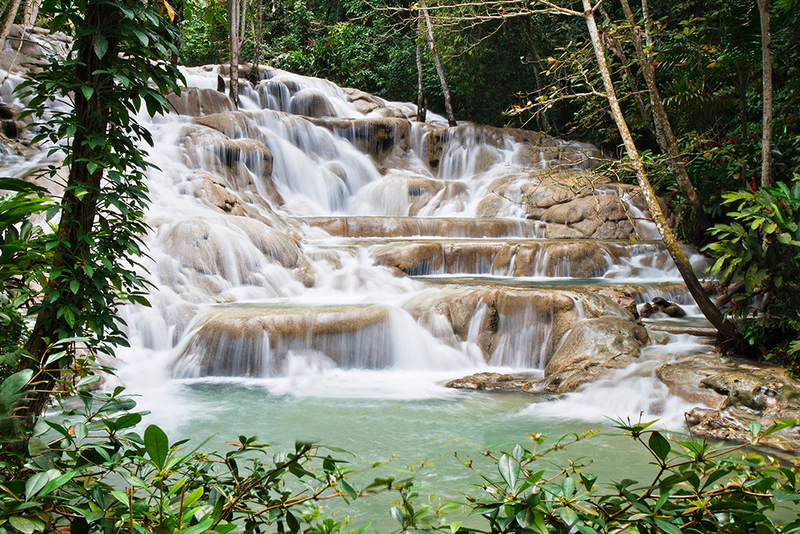 Located in Ocho Rios, Dunn’s River Falls is a must visit. The 600 feet cascading falls are stunning. Mystic Mountain allows you to experience bob-sledding, and also has a zip line and water slide. Another popular activity is actually marriage. 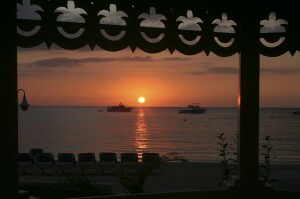 Hotel marriages have become a considerable contributor to the number of marriages on the island. They are performed by a marriage officer on the island. Jamaican food is a mixture of local dishes and Caribbean dishes. There are many local cuisine options to choose from. One of the national dishes is Ackee and saltfish. It is made with Ackee, a local fruit, and dried codfish mixed with tomatoes and onions. Another local option is called bammy, which is a flat floury cassava pancake, and was actually invented by Arawak Indians. It is a breakfast dish. Jerk chicken with jerk seasoning is also a popular dish. There are many fruit and vegetables to choose from in Jamaica. Some fruit options include: pawpaws, pineapples, oranges, star apples, and guineps. They are all locally grown and inexpensive. For those who want to dive right into Jamaican culture, there is “ital” food, which is what practising Rastafarians eat. They follow a very strict dietary guideline, and their food is prepared without meat, oil, or salt. For drinks, try Champagne Cola, Bigga Cola, or Ting, which are some local soda options. 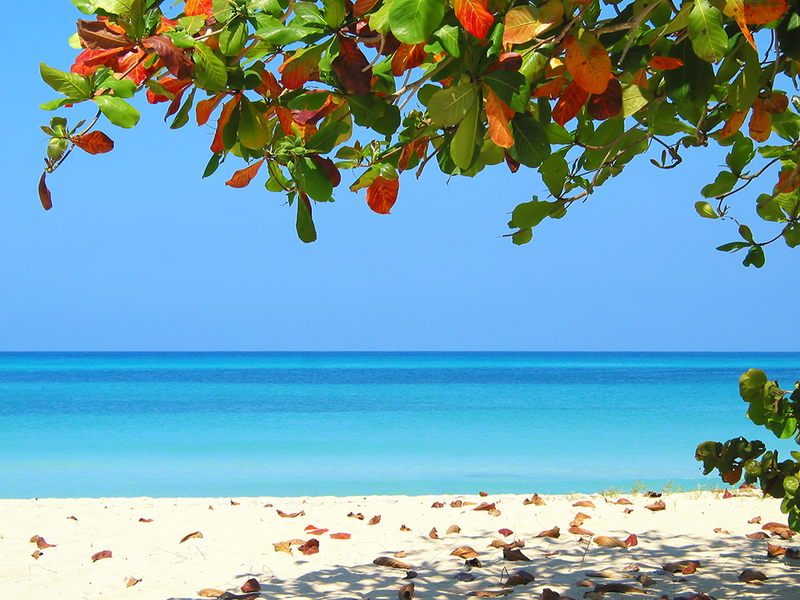 Jamaican Rum is a local hard drink which is made from sugar cane and served with fruit juice.